White Horn Brook Apartments is a new residence hall currently in design on the URI campus. It is being designed as one of the greenest residential buildings on campus. It is the future home of the Sustainability Living & Learning Community (LLC) students and upperclassmen and will be located across from Meade Stadium, near the Wiley/ Garrahy complex. 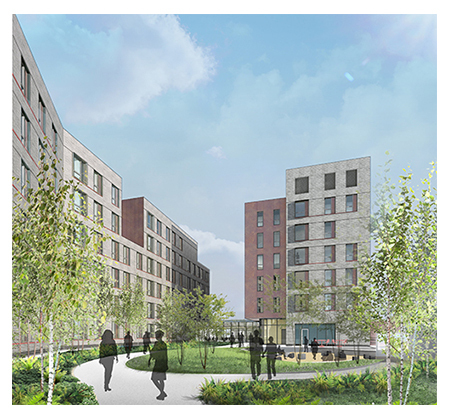 As a model for green living, the apartments will present student residents with the opportunity to experiment and learn about what it’s like to live a greener lifestyle. The project will include a footprint in excess of 200,000 sf and 500 units. The units are intened for upperclass, third and fourth year students, and will feature apartment style, one unit rooms complete with private cooking facilities and amenities. The project value is currently estimated to be in excess of $80 million. • Features: Private units with apartment style amenities.